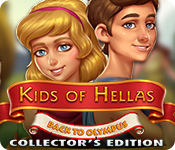 Kids of Hellas: Back to Olympus Collector's Edition is rated 3.8 out of 5 by 19. Rated 5 out of 5 by beezelbom from An Excellent game I purchased this when it came out but only just now got around to playing it. I have to truthfully say I enjoyed it even more than the Hercules ones. I have them all and find them to be a lot of fun. I think that the story in this game was better, it just seemed to have more direction. These kids are driven to get home so there is a feeling of real purpose to the story. Where as with Hercules I always feel like I am bailing him out of just another poor choice. Oh and Hercules comes across as just to self-centered. I sure wish my kids had this kind of purpose and drive. Enough said, I do recommend this game. Rated 5 out of 5 by KateyBog from Wonderful new TM game Amazing game! There is everything I always loved in Hercules and Alicia Quatermain series, and some new interesting details. You collect not just common golden coins but Golden Fleece producing by sheep or farms. If you want to use bonuses, you have to build and then visit a mana well. The main characters work themselves without using additional workers, and that makes them self-sufficient. Nevertheless the characters are children. Not common children but Zeus’ sons and daughters, very strong and clever, but still children. The story is quite interesting and narrated in a good way with verses in Ancient Greece style and funny dialogues. Hades envies his brother Zeus and decides to punish him for boasting. For that he asks Ate to cast an awful curse so that Zeus’ children fall down to the Earth, and their father forgets about them. Kids face many difficulties of life on the Earth, but stand all of them. After the Earth they get to the underground world and even to sea monster’s stomach! And it is really interesting to play in such locations. 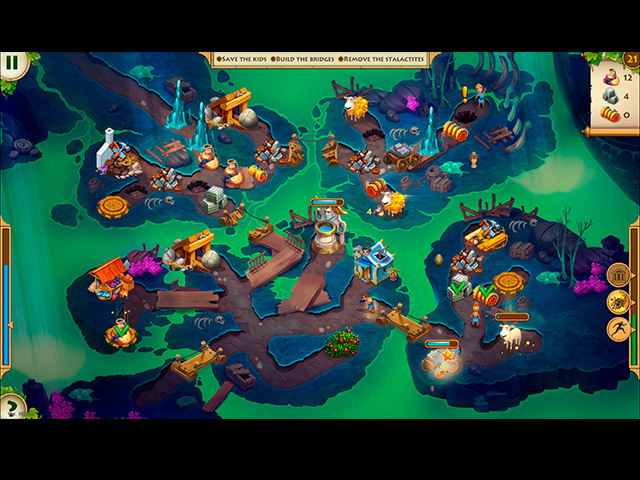 The gameplay is well known and understandable. 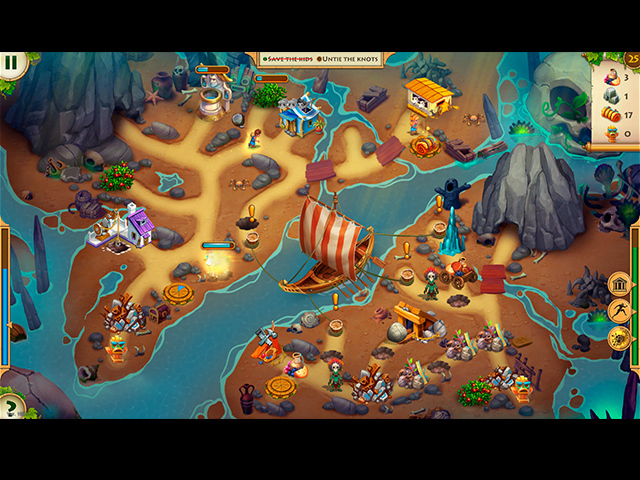 You repair buildings and bridges, remove roadblocks and collect resources. On easy and normal modes you can just relax and have fun earning three stars. Hard mode (if you want to earn three stars and beat the records) is a real challenge. In the beginning the goals and the levels are easy but after them the game becomes more interesting and you have to think where to go first, what to build and which bonus to use. Also graphics is very good and bright; music is funny and not annoying. Kids of Hellas is a nice game I’m going to play and play to beat all the records, earn every achievement, find all the puzzle pieces and unlock all the bonus levels. I’m really excited about such a great way to spend many hours. Rated 5 out of 5 by Karavan from Beautiful, cheerful and fun Love this game. The graphics and animation are so bright and cheerful. The music is pleasant and just an overall good time. Purchased immediately after the demo. Easy enough to get three stars in the beginning but may get harder. I enjoy finding the puzzle pieces and don't know if I will need the strategy guide later so went ahead and sprung for the CE. So glad to see another TM game! Rated 5 out of 5 by Trash89 from A Great Game I loved the game and the graphics. Hope there will be a normal version as the CE is to expensive. I do hope that there will be a 12 tasks in the future as I miss Hercules and his minions. The kids in this game sure know how to create the gold stars. Rated 5 out of 5 by godfreygirl from GREAT game! I bought this as soon as I played a couple of the trial levels. The graphics are great, game play is smooth, the characters move fast....and that's important to me.....and everything about this game is great! I thought it would be more like the 12 Labours of Hercules series, but I think it is more like the Alicia Quatermain series. I have all of them and love them too. There is nothing about this game not to love.....great game! I highly recommend it. Have fun guys and gals!! Rated 5 out of 5 by Ndwelt from OH Yeah! Bring on the TM's (PLEASE) Personally, I love the artistry, the colors, the storyline concept and the poetry. The gameplay is smooth in normal and then I will see if I can whoop the expert level in gold. The last TM Roman Adventure: Britons Season One is still my favorite. I am still playing trying to capture gold on every level. It easily could have been a Collectors Edition in my mind, much more than some of these others. A must play for all TM lovers. But this is comparable and finding the hidden Hercules puzzle pieces can be challenging. Rage on my TM fanatics!! Rated 5 out of 5 by rudy1959 from Excellent Game! What a fun game! Very well thought out and glitch free. The kids actually move fast, there's strategy and wonderful graphics. It's a lot like the other Hella's games but, this one seems more well put together. I LOVE being able to build on my own and not task it out to a worker. That saves a lot of time. I recommend this one!! Rated 5 out of 5 by joybelle_1 from Genuine TM fun and strategy This game is made by Jetdogs who make the "Hercules" series, and it's quality just shines through. Wonderful graphics, smooth gameplay where characters almost glide to the spot on the first click, and plenty to think about in terms of best strategy. There are three levels of play, relaxed, normal, and difficult. As an intermediate player I find normal perfect, but it's good to see the experts are catered for also. There is a strategy guide too. There is the usual TM needs to do, build and upgrade buildings, rescue workers (who are kids this time), and gather resources. And as it's a jetdogs game..find the puzzle piece! The graphics are outstanding, and each time I opened a level I found myself totally consumed with figuring out my strategy. 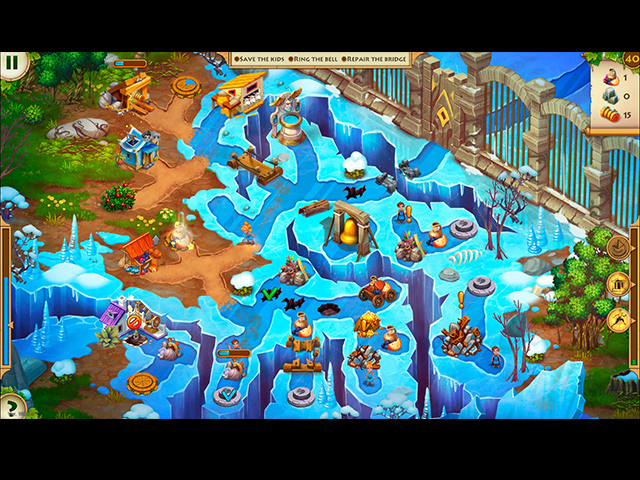 Looking for workers, looking for sheep who provide a golden fleece resource, and the utility buildings (kitchen, mines, workshop) And in this game also a fountain of mana, which automatically refills your bonus bar. Just as valuable to give you control as any amount of gathered stock. The bonuses are run fast, speed up building, extra worker, extra resource. (so far) One new feature I really enjoyed was trying to get to something with a patrolling minotaur near it. You must time your run, or get what is similar to an electric shock sending you back. This is TM at its best and I am sure you will find it enjoyable for the eyes too. Enjoy!